Instead I’ll just clue you in on the new flavors in the Life Savers Gummies line. The package I received says â€œIsland Fruitsâ€ and sports the flavors Strawberry Kiwi, Mango Melon, Fruit Punch, and Pineapple. To start my sampling, I brought one of each flavor out of the package. Their colors are dark red, light red, yellow, and orange. I’m a smart girl, so I knew right away that the yellow one was pineapple. (Go, me!) After a little thought, I deduced that the orange was mango melon – but I was unsure how to figure out which was which on the two red ones without eating one. Fortunately, Wrigley knows that some Candy Addicts have more important things to think about than the color designations of various flavors. I noticed that the package had the flavor names “coded” with a specifically-colored circle next to each name. Wow, genius! The dark red are fruit punch, and the light red are strawberry kiwi. I thought the fruit punch was a decent flavor â€“ a sweet Kool-Aid or Jolly Rancher style. When I tried the pineapple just a few minutes later, I was surprised that I could barely tell a difference from the fruit punch. I’m not sure if my tastes buds were overwhelmed somehow and couldn’t detect the subtle flavor differences under so much sugar or if the flavors really are quite similar. On further sampling, I still think the various flavors are less than distinct. I doubt I could tell the difference between strawberry kiwi and fruit punch in a blind taste test. I must admit that the texture itself makes it hard for me to impartially savor any flavor. 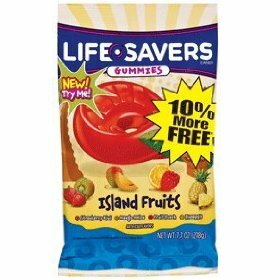 If you like fruity flavors and gummy textures, though, these would make a nice in-your-pocket candy.